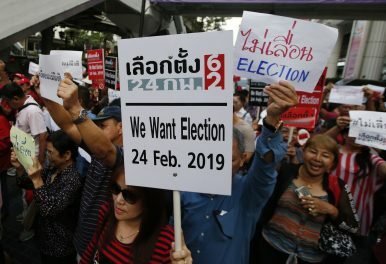 Demonstrators in Bangkok rally to demand the general election, scheduled for February 24, not be postponed (Jan. 8, 2019). Is Thailand’s Election Going to Be Delayed Yet Again? Protesters take to the street, demanding that the military junta to stick to an announced February 24 election date. About 200 protesters staged a rare demonstration Tuesday in military-ruled Thailand, demanding that there be no further delays in holding elections. The polls had seemed set for February 24, but that date may slip, apparently because of the coronation of King Maha Vajiralongkorn on May 4. Critics of the military government, which seized power in 2014, wonder if it is using the recently announced coronation date as an excuse to push back the elections. A key announcement expected last week that would have confirmed the polling day did not happen, sowing widespread confusion and doubts that the government and the election commission have so far failed to clear up. The peaceful protesters descended with little advance notice on a busy intersection in Bangkok’s commercial district. Chanting, banging drums, and waving placards, they demanded the poll go ahead on time. Until recently, political gatherings of more than five people were illegal and participants liable for arrest. On Tuesday, police kept a discreet distance and did not intervene. The government of Prime Minister Prayut Chan-o-cha seized power in a coup in 2014. Since then, the military junta has a long record of promising elections, but then finding reasons to delay. Many opponents believe the current confusion is a deliberate attempt to stall until Prayut is sure that pro-military parties can win enough seats to return him as prime minister. The military has already pushed through a new constitution to ensure its continued political influence, even if a civilian democratic party comes out on top in the eventual polls. The venue of the protest — Bangkok’s Ratchaprasong intersection — has great symbolism for anti-military protesters. It was the site of a chaotic months-long mass camp-out by thousands of demonstrators in 2010 that brought prolonged disruption to the city. The protest by demonstrators known as Red Shirts who said they were seeking democratic rule was crushed by an army assault in May of that year that left around 50 people dead. The future picture for the election date remains uncertain. There are restrictions around how delays would be handled, and some have suggested that a likely scenario would be polls being delayed to sometime in March. By the Associated Press with additional reporting by The Diplomat.